영향력이 강한 예먼(예멘)인 하셈 알 가일리가 전 세계 자신의 추종자들에게 자신의 과학에 대한 사랑을 퍼뜨리면서 거대한 온라인 팬군단을 창출시켰 놓았다. [시사뷰타임즈] 21세기에 기업가가 된다는 것에는 소셜미디어를 어떻게 이용할 것인지를 아는 것도 포함된다. 일부 사람들에게는. 소셜미디어를 이용하는 것이 세계를 여행할 수 있을 정도로 수지맞는 직업이 될 수도 있고 아니면 껍질이 없는 갑각류처럼 매일 매일 실시간 동영상을 올리면서 생계를 이어가는 수단이 되기까지도 한다. 그러나 일부 사람들은 인터넷의 파급력을 이용하여 과학 교육을 촉진시키는 바, 한 절은 예먼인 남자가 기꺼이 시청하고 듣기를 원하는 사람을 거의 2천만명 가까이 만들어 놓았다. 위의 영상에서 과학의 열성적인 팬 하셈 알 가일리가 자신의 훼이스북에 짧은 영상을 하나 놀리면서 어떻게 언론에서의 상담자이자 대중 연설자가 됐는지를 한번 보시라. 이 사람에 대한 이야기나 BBC캐피틀에서 여러분들이 본 그 어떤 것에 대해서라도 한 마디 하고 싶으면 BBC 훼이스북 페이지나 트위터로 가서 글을 남기기 부디 글을 남겨주시기 바란다. 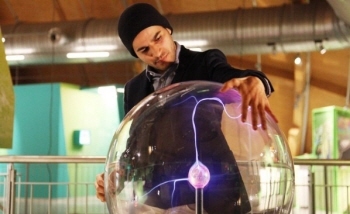 Yemeni influencer Hashem Al-Ghaili has created a massive online following by spreading his love of science with followers around the world. Part of being an entrepreneur in the 21st Century is knowing how to work social media. For some, it can even lead to a lucrative career that lets them travel the world, or even find a livelihood by live-streaming daily tasks like shucking shellfish. But some people are using the internet's reach to promote science education - and a young Yemeni man has found close to 20 million people who are willing to watch and listen. Have a look at the video above to see how science enthusiast Hashem Al-Ghaili became a media consultant and public speaker by uploading short videos of his own onto Faccebook.